1867—Capt. William Reynolds of the screw sloop-of-war, USS Lackawanna, raises the U.S. flag over Midway Islands and takes formal possession of these islands for the United States. 1891—During a period of political unrest at Valparaiso, Chile, Marines form boarding parties from cruisers USS San Francisco and USS Baltimore to protect American lives and guard U.S. Consulate. 1942—One hundred twenty women are commissioned as ensigns or lieutenant junior grades as WAVES (Women Accepted for Volunteer Emergency Service) and report to "USS Northampton," Smith College, Northampton, Mass. 1942—PBY Catalinas from VP-92 and Canadian corvette HMCS Oakville sink German submarine U-94. USS Lea (DD 118) and Oakville pick up the survivors. Previously, U-94 had sunk 26 Allied vessels while also damaging one Allied vessel, although none from the United States. 1952—USS Boxer (CV 21) launches an explosive-filled drone which explodes against a railroad bridge near Hungnam, Korea. This mission marks the first guided missile launched from a ship during the Korean War. 1991—A helicopter from USS America (CVA 66) rescues three civilian sailors who spent 10 days in a lifeboat 80 miles off Cape May, N.J., after their sailboat capsizes. 2004—USS Momsen (DDG 92) is commissioned at Panama City, Fla. The 42nd of the Arleigh Burke-class of guided-missile destroyers is the first to carry the remote minehunting system and the first ship named after Vice Adm. Charles B. Momsen, the designer of the submarine escape breathing apparatus now known as the Momsen Lung. In national news, dominating today's headlines are reports that the two victims killed by a gunman at a restaurant in Jacksonville, have been identified as Taylor Robertson, a 27-year-old from Giles, West Virginia, and Eli Clayton, a 22-year-old from Woodland Hills, California; and reports that the United States and Mexico have reached an agreement to change parts of NAFTA. With recent contracts to modernize the USS Cowpens and USS Gettysburg, which recently entered their final year in layup as part of the "2-4-6" plan, the Navy appears to have fulfilled a promise made to congress not to decommission the aging warships as the Navy seeks to extend the service lives of the cruisers reports Defense News. USNI News reports that the Navy's F-35C Lightning II Joint Strike Fighter has been incorporated into a carrier air wing's cyclic flight operations for the first time alongside aircraft from Carrier Air Wing 7. USNI News also reports that all Hawaii based ships and naval bases were unharmed by Hurricane Lane. Military Times tells the tale of, at the time, SA Fonseca, a Hospital Corpsman assigned to a Marine Battalion, and his actions under fire during the Iraq War. "As we came up and over the bridge, we ran right into an ambush," he said in a 2008 Department of Defense release. "They threw all they had at us — small arms fire, heavy machine gun fire, rocket propelled grenades, mortars and artillery rounds." With all hell breaking loose, an amphibious assault vehicle to Fonseca's front was struck by a rocket propelled grenade, inflicting five casualties. "I noticed I had two patients with partial lower-leg amputations, one with flash burns to his eyes, and all had shrapnel wounds," the corpsman said. "I applied tourniquets on the two Marines with the partial leg amputations and instructed the other Marines around to apply battle dressings on the others that were wounded." Because the convoy had broken up at the outset of the firefight, the disabled vehicle he was looking for wasn't where it was supposed to be. Exposed and unsure where it was, Fonseca ran through more fire to get back to his vehicle. "Two of them were on our right side," he said. "One was on our center top hatch. All three were … 122 mm mortar rounds. The fourth and final round that disabled the truck was a recoilless rifle round that blew up our transmission." All wounded Marines from Fonseca's vehicle, except one, were quickly transferred out of the kill zone at the direction of the corpsman. "I picked up the last Marine … and carried him to a ditch," Fonseca said. "The Marine and I sat in the ditch for about 30 minutes before I could get another vehicle to pick us up and drive us out of there." On top of the 18 killed, "fifteen others were wounded and left the battlefield, and about 10 others [who] were wounded … stayed," Fonseca said. The corpsman treated and coordinated the evacuation of nearly a dozen Marines that day. For his bravery, he was awarded the Navy Cross, the service's second highest award for valor. 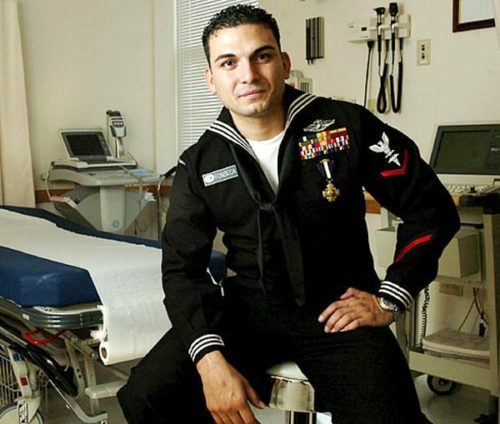 "The Navy Cross means to me honor, sacrifice and loyalty," Fonseca said. "Honor because it is my honor to wear the Navy Cross for my brothers that gave their lives in that fight. So, it's my honor to wear their Navy Cross that honors them. A lot of men sacrificed that day. Unfortunately, some families and friends had to sacrifice their loved ones." When the fighting finally slowed, Gunnery Sgt. Myers, who once told Fonseca, "I'm only going to tell you this once. I don't like corpsman. Stay out of my way," approached the exhausted 23-year-old "doc." "He came up to me and gave me a big hug," Fonseca said. "With pride in his voice, he said 'Doc, you did one hell of a job. Oorah Marine!' He became one of my biggest mentors." "The job of a corpsman is to go through hell and back for your Marines," Fonseca said in a release. "My brothers needed me, so I was going to be there for them. As long as I was alive, I would keep working, even if it meant my life. I wish I could have done more." Another humble hero. Since there really isn't anything I can add, I'll just leave it here. The Committee of 100 works to further CCP social, economic, and political goals in the United States. Why is this permitted? Why are C-100 leaders not at least required to officially register as a foreign agents? Page 3: "Marine Hero's Medal of Honor Given To His Parents"… "Second Lieutenant John P. Bobo, USMC, of Niagara Falls was awarded the Medal of Honor posthumously, credited with saving his platoon in Vietnam. Secretary of the Navy Paul Ignatius presented the Medal of Honor to his parents at the Marine Corps Barracks in Washington that included a full Friday night Evening parade ceremony… . (1) An A-1H of the 56th SOW out of Nakhon Phanom was heavily damaged on a landing at a forward strip in Laos. While undergoing repairs the aircraft suffered additional damage rendering the aircraft beyond repair. The aircraft was scrapped. (2) LTJG ROBERT RAY DUNCAN and LTJG ALAN FREDERICK ASHALL were flying an A-6B of the VA-85 Black Falcons embarked in USS America on a night Iron Hand SAM suppression flight in the area of Vinh Son, about 20 miles northwest of Vinh. They perished on the flight. "During my almost 7 1/2 years in North Vietnam my greatest tribulation was that of overcoming my grief at having subjected my wife and children to the painful and difficult experience that they were to undergo. However, I had great faith and confidence in my wife's ability to overcome these difficulties and that faith has been rewarded by a strength and steadfastness that far exceeded my greatest expectations. RIPPLE SALVO… #907… The New York Times ran a comparison of the Democratic and Republican Vietnam planks on 27 August 1968. 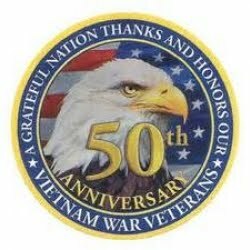 VIETNAM POLICY: Democrats: "We strongly support the Paris talks an applaud the initiative of President Johnson which brought North Vietnam to the peace table." ; Republicans: "The Administration's Vietnam policy has failed–militarily, politically, diplomatically, and with relations to our own people." MILITARY: Democrats: "Stop all bombing of North Vietnam when this action would not endanger the lives of our groups in the field: this action should take into account the response from Hanoi." ; Republican: "The Administration's piece-meal commitment of men and material has wasted our massive military superiority and frittered away our options. The result has been a prolonged was of attrition." RTR quote for 28 August 1968: JAMES MADISON, Letter, 1822: "A popular government without popular information, or the means of acquiring it, is but a prologue to a farce or a tragedy, or perhaps both. Knowledge will forever govern ignorance, and a people who mean to be their own governors must arm themselves with the power which knowledge gives." Item Number:1 Date: 08/28/2018 AFGHANISTAN - 8 TALIBAN FIGHTERS KILLED IN AIRSTRIKE ON BORDER WITH TAJIIKISTAN (AUG 28/RFE/RL) RADIO FREE EUROPE/RADIO LIBERTY -- At least eight Taliban fighters have been killed and six wounded in an airstrike along the Afghan border with Tajikistan, reports Radio Free Europe/Radio Liberty. On Monday, jets struck Taliban positions in the Darqad district of Takhar province, said local police. The origin of the aircraft was unclear. Both the Tajik and Russian governments denied that their aircraft were involved. Russia maintains a military presence in Tajikistan. Afghan officials quoted by Tolo News (Afghanistan) said the jets were Tajik. The airstrike followed a shooting on Sunday that killed two Tajik forest rangers. Both Tajik officials and a Taliban spokesman blamed the shooting on drug-smugglers. Clashes are rare along the border but have increased recently amid deteriorating security in the region. Item Number:6 Date: 08/28/2018 CHINA - TYPE 001A AIRCRAFT CARRIER BEGINS FINAL SEA TRIALS (AUG 28/SCMP) SOUTH CHINA MORNING POST -- The first indigenously-built Chinese aircraft carrier has entered its final sea trials, reports the South China Morning Post. Photographs released by the Chinese military on Sunday showed the carrier being pulled by several tugboats into the Yellow Sea, some three months after its initial sea testing. The trials could take between six and 12 months to complete, said analysts. The tests will focus on evaluating the ship's propulsion, communications, weapons and damage control systems, said one Hong Kong-based analyst. Take-off and landing tests with helicopters and carrier-based jets are also likely. The Type 001A is expected to be commissioned before the 70th anniversary of the People's Republic of China in October 2019. Item Number:9 Date: 08/28/2018 LIBYA - CEASE-FIRE REACHED IN TRIPOLI AFTER 5 KILLED, 33 INJURED IN CLASHES (AUG 28/LIBOB) LIBYA OBSERVER -- A cease-fire has come into effect after heavy fighting in the Libyan capital between government forces and militias, reports the Libya Observer. On Tuesday, fighters withdrew from many areas of Tripoli's southern suburbs and security forces resumed control of checkpoints, reported the news channel Libya Al-Ahrar. Under the cease-fire agreement reached on Monday, all sides must remove heavy weapons from the areas where fighting took place, said Jalal al-Wershifani, a senior commander of the Tripoli Revolutionaries Brigade. The 7th Brigade would return to its home district of Qaser Bin Ghashir, he said. Fighting broke out on Sunday between the Tarhuna-based 7th Infantry Brigade, also called the Kani or Kaniat Brigade, and a group of Tripoli-based militias., reported the Libya Herald. At least five people were killed and 33 injured in the violence, according the Tripoli-based health ministry. Residents reported heavy gunfire and the deployment of tanks and armored vehicles, reported Al Jazeera (Qatar). Both sides accused the other of fomenting the violence, accusing the other expanding into new territory. Item Number:11 Date: 08/28/2018 MALI - ISIS DEPUTY KILLED IN FRENCH AIRSTRIKE (AUG 28/AFP) AGENCE FRANCE-PRESSE -- The French military says it has killed a senior leader of the local affiliate of the Islamic State terrorist group (ISIS) in northeastern Mali, reports Agence France-Presse. Overnight Sunday, two French Mirage 2000 jets attacked targets in the Menaka region, the French armed forces said in a statement. Ground forces followed up on the airstrike and confirmed the death of Mohamed Ag Almouner and his bodyguard at an isolated camp, said an army spokesman. Ag Almouner was a deputy leader in the Islamic State in the Greater Sahara (ISGS) militant group, the spokesman said. Two civilians, a woman and a teenager, were also killed. Two civilians and an ISIS member were injured in the strike. The link between the civilians and the ISGS leader was unknown, said the spokesman. The French statement expressed regret at the loss of civilian life and promised an investigation. ISGS is believed to be responsible for the October 2017 ambush that killed four U.S. Green Berets. Item Number:16 Date: 08/28/2018 USA - NAVY DEMONSTRATES AIR-LAUNCHED DECOY CAPABILITIES IN FREE-FLIGHT TESTS (AUG 28/FG) FLIGHTGLOBAL -- The U.S. Navy's next-generation miniature air-launched decoy (MALD-X) has successfully completed a series of free-flight demonstrations, reports Flight Global. The flights were conducted at the Point Mugu Range in southern California on Aug. 20 and Aug. 22. The project aims to demonstrate the operational effectiveness and tactical advantages of large numbers of collaborative, expendable platforms, the Pentagon said in a release on Aug. 23. The MALD-X has an improved electronic warfare payload, enhanced net-enabled data link and can perform low-altitude flight. It is modular, allowing the Navy to insert adaptive payloads and capabilities for future missions. The decoy is slated for integration with the Navy's F/A-18E/F Super Hornet fighter jets. The service plans to conduct additional tests on other enhancements to the MALD-X next year.